Cherry Hill Police are hoping to identify multiple men in reference to a two separate thefts in the township. Cherry Hill Police are on the look out for a man who is suspected of committing a theft at the Victoria’s Secret store inside the Cherry Hill Mall. The man is shown in a surveillance photo wearing a red shirt and black pants. Anyone with information is asked to contact Det. Scarlett at (856) 432–8833 or rscarlett@cherryhillpolice.com. Feather Nest Inn theft suspects. 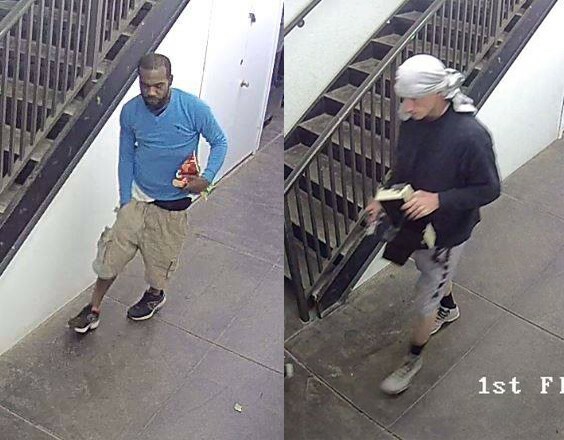 In a separate case, police are also looking for two men who are suspected of committing theft at the Feather Nest Inn, located on Hampton Road in Cherry Hill. Anyone with information on either of these suspects can contact Det. Leone at (856) 432–8828 or tleone@cherryhillpolice.com. Information on either of these cases can also be provided anonymously at tips@cherryhillpolice.com or http://nj-cherryhill.civicplus.com/forms.aspx?FID=84.